While I can’t make diagnoses, odds are your kitty is most likely dreaming. Cats, like humans, dream. Our dreams are based on our experiences and imagination, and to some point so are cats’ dreams. When they sleep, they can recall past experiences and instincts may come alive. Some believe cats have a limited degree of an imagination, too. From what I’ve read, not all animals can REM sleep, and not all animals who can REM sleep dream. Experts believe that more advanced animals like chimpanzees, horses, cats and dogs dream; however, dolphins, which are believed to be highly intelligent, do not. 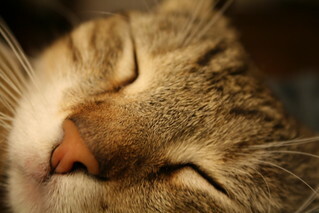 REM sleep usually occurs 15 minutes after the cat falls asleep. Like humans, you can notice it happening when you see movement under the eyelids, breathing changes, twitching ears or whiskers, and facial spasms. Some animals, like dogs, are even to run in their sleep. Others like the platypus imitate the process of killing prey before eating it. The next time your cat falls asleep and begins these motions, watch carefully and try to figure out what he’s dreaming about. 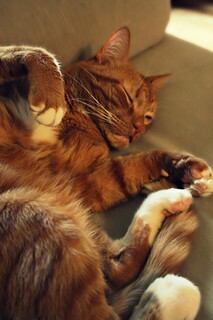 Some say that when a sleeping cat makes paw and mouth movements he’s remembering or imagining a hunting adventure. Like us, some dreams may be pleasant, while others may be exciting or scary. Thankfully, during sleep, our brain releases “inhibiting substances” that stop us from actually living out the dream in its entirety. Nevertheless, that doesn’t stop us from tossing, turning and talking in our sleep — just like our kitties. While I have no proof of this, I wonder if some CH cats may have more vibrant dreams because their brains are different. Now CH only impacts the cerebellum, but I wonder if any other part of the brain was also a bit underdeveloped, that may impact how greatly the brain inhibits an animal’s actions while sleeping. Now, if you’re experiencing that or see random eye movement, changed breathing patterns and twitching (not including head tremors) while your kitten is also awake, you may want to document what’s going on and take him to the vet. However, if your kitten isn’t going through those motions, odds are he just may be having an exciting dream. Does your CH cat twitch or show other dreaming characteristics while they sleep? Please share in the comments! We have recently adopted a 3yr old CH kitty – christened her Tipsy. She is not generally too severly affected but does have the same extremely twitchy dreams as Lauren’s cat, far more movement than in any normal cat I’ve ever seen dreaming. Her legs move as if she is running and sometimes her whole body seems to jump off the couch/my lap/bed. I find the best thing is not to wake her up but to just stroke her gently on the top of the head and maybe cuddle her a little – seems to calm her down. See http://www.youtube.com/watch?v=8JBX13TOOrg for a mother cat calming her dreaming kitten. Ash will even talk or chatter to stuff in his dreams, sometimes he will even make like he is eating while he is twitching, it is so cute! I am terrified about my kitten right now, because she had terrible fleas and we had no lemon juice or anything but adult cat flea and tick shampoo. She has been sleeping a lot since the bath and twitching in her sleep and I hope it isn’t cause of toxicity of the ingredients in the shampo, we just got her and have yet to take her to the vet so we don’t know how old she is yet now I feel like a bad mommy for doing that flea bath! Has anyone had any experience with this?! Hi , I am new here my friend posted a video of a CH Kitty and I saw him and straight away knew my beautiful Puscca has CH. He came to live with me randomly and has been a blessing ever since. Puscca has always walked very jerkely and fallen over when he scratches himself which I could live with but what worried me was that he has very violent and extreme dreaming episodes where he sometimes flies through the air and lands on whatever is nearby. (Yes flies through the air !!) He never seems to get hurt and usually jumps straight back up into his bed. I always knew that with REM sleep your body shuts off somewhat which is how I reasoned he wasn’t getting hurt. Because of these (fits) Puscca has set sleeping spaces which we try to enforce for his safety plus he rips holes in fabrics during very extreme episodes. I just wanted to thankyou so much for this information I have searched for years for a reason for all of his symptoms (my vet put him on 6 weeks of toxoplasmosis drugs when we first found him). I know that there is no cure but just being able to understand that Puscca isn’t going to get worse and he can live a normal (yet modified) life has been a great relief to me and my family! I wouldn’t swap Puscca for anything !! I’m not sure if my cat is a CH one,cuz he acts normal as other normal cats when he’s awake,but he does twitch a lot when he sleeps. I have a 3 1/3 tear old male tabby that dreams. Since January 2014, he has bitten me 6 times during his dreams. Is this normal? Is it his instincts coming alive through his dreams? He and 3 of his siblings were born in early September and was the 2nd litter that year for their mother. Once they were mobile and had their eyes open, she abandoned the 4 kittens. We brought the 4 in to the house and managed to save 2 of them – this tabby and his sister. We are the only parents they know and they have been house cats since.We were afraid the other outside cats wouldn’t accept them so kept them in the house. We got a kitten for my birthday in February and he’s only 4 months. After a few minutes of petting him to sleep, he wakes up and starts spasming out but then I just pet him till he calms down. He is also kind of chubby so we aren’t sure if it’s just kitty fat or worms..
I’ve had an older tabby cat for a little over 6 months now. when he falls asleep next to me, he’s fine. peaceful and quiet. Then about half an hour or an hour later, he starts jerking his whole body. Sometimes, just his back legs. I’ve tried saying his name during these episodes, but he doesn’t answer. So i pet him softly and he wakes up. I think he’s a little startled, but calmed down quickly and falls right back to sleep. i’m just worried because with him being older, I don’t want anything bad happening to him. He’s fine when he’s awake btw. I only notice this behavior when he’s sleeping in bed with me. Kona does the same thing when she sleeps. Sometimes she bunny kicks me right in the face. If I wake her up she stops kicking. I’ve been trying to research how long it takes for a cat to reach REM sleep and I read in this article that that you’ve said it it usually reach at 15minutes into sleep. Tarras is currently in what seems like REM/Deep sleep. He’s out like a light. I’ve noticed him ”snoring”, ”moaning”, and plenty of paw, ear, facial, and tail twitching. Doesn’t seem like anything dangerous or hurtful for him. He must be having some exciting dreams inside his tiny head, causing him to do such things. He only seems to reach this level of sleep, while he naps beside me while I game away on my PC, or other console. Once he wakes up, there’s quite a lot of stretching, and head bumps coming my way! My kitten is CHEWING in her sleep what does this mean? My kitty isnt a CH kitty, but it twitches and rolls its eyes everytime she sleeps with me….sometimes i get awakened by claws in my legs..lol…..its sometimes creepy when her eyes are open and all you see is white…like shes possessed…..funny how cats are…and she stretches just like i do when i move or get up…. My Ziggy is a very active dreamer! He even growls and his little tail puffs up like he is getting ready to show someone a thing or two. His legs move quite a bit too and he has kicked the tar out of me many times. Petting does seem to help calm him when this happens. My CH boy is 18 months old and he usually starts twitching when he falls into a deep sleep when he lays on my chest. I usually pat his back and he stops. Tonight he was sound asleep and his paw and back foot were twitching and he was making a funny noise with his mouth. I put my hand gently on him and he stopped. But when he woke up and after he gave himself a bath there was a big wet spot that was under him. I cannot be positive if it was urine or not. Should I be concerned?